In the 1880’s, Bishop Martin Marty asked the Presentation Sisters in Ireland to come to Dakota Territory and teach children of the Lakota Sioux and European settlers. In 1886, Father Haire invited the Presentation Sisters to open the first school in Aberdeen. 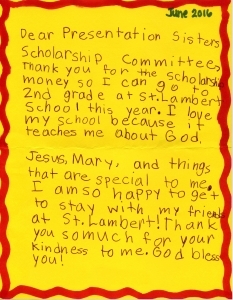 An education ministry that began when the Presentation Sisters responded to this invitation. Two hundred thirty-two Presentation Sister teachers have touched the lives of over 300,000 students over the years. Today the Presentation Sisters can be found ministering to the needs of those in all walks of life, yet they remain grounded in their first ministry: education. Their education ministry has grown from primary and secondary schools to include colleges, parishes, ESL classes, hospitals, seminars and other venues where education is a key component. Nano Nagle, our Irish foundress, began her ministry by teaching children when Ireland’s penal laws forbade it. Her belief in the power and importance of education has spanned the centuries and continues to shape the ministry of Presentation Sisters around the world. Through education people are better equipped to answer the challenges with which they are faced. Education is the underlying fabric that weaves itself into all of the Presentation ministries. Our mission is to go where there is the greatest need for apostolic service. When the Presentation Sisters came to South Dakota, the greatest need of the people living in the area was for education. As the years have passed, many other needs have arisen that have led our sisters to a broader spectrum of service. In addition, as more teachers came to the area, the need in education was able to be met by non-vowed religious, allowing us to concentrate more of our resources on additional needs of the people. 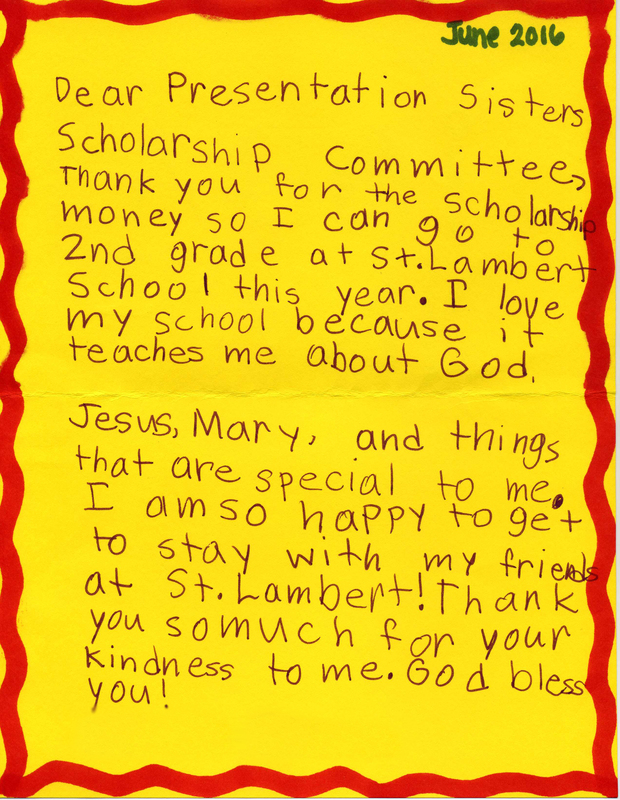 In keeping with the Presentation Sisters belief and commitment to Catholic education, we are pleased to announce that we will once again be accepting applications for Presentation Sisters Catholic School Scholarships. For the 2019-2020 school year, we will be awarding 40 – $750 tuition assistance scholarships for students in K-12 and three – $1,500 tuition assistance scholarships for high school students. (one scholarship to each Catholic high school). Catholic School pastors and principals in the Sioux Falls Diocese have received the application forms for the upcoming school year. This year brings one change in the way the scholarships are processed. We will be limiting submissions to one scholarship application per family for K-5. This will mean that if the family has multiple children in grades K-5, they will submit one application on behalf of one child. We invite any interested student to complete the application process. Application forms are listed below for the $750 K-5 scholarship, the $750 6-12 scholarship and the $1,500 high school scholarship. We encourage any high school students to apply for both scholarships. Along with the application form, an essay is also required; please refer to the application form for the information to be included in the essay. Please make additional copies of the applications as needed. Submission deadline is Friday, March 15, 2019. If you have any questions, please contact either Sister Phyllis Gill, Vocation Director at 605-229-8414 or pgill@presentationsisters.org. Presentation College is an independent Catholic educational institution, sponsored by the Sisters of the Presentation of the Blessed Virgin Mary (PBVM). It has origins in Mitchell, South Dakota, in 1922 when the Right Reverend Monsignor J.M. Brady, Pastor of Holy Family Church, established Notre Dame Junior College, a parochial junior college. Notre Dame Junior College continued to operate in Mitchell until 1951, when Monsignor Brady gave sponsorship of the school to the Presentation Sisters who had staffed Notre Dame Junior College since its beginning. The name was changed to Presentation Junior College and it was relocated to Aberdeen, South Dakota. For three years (1951 – 1954) it was housed in Butler Hall on the same location of the Presentation Convent of that time. Upon completion of the new convent and college of the Presentation Sisters it was moved to the 100-acre property located in North Aberdeen. The property was also known as Presentation Heights. Its primary function continued to be the education of sister-students and young women who aspired to teaching. In 1962 the Presentation School of Nursing affiliated with Presentation Junior College and in 1965 the title was officially changed to “Presentation College” and became co-educational in 1968. Today the Presentation Sisters continue to play an active role the lives of the students and sponsor the college. The Presentation Sisters strive to share their faith and religious life experiences with Presentation College students in an effort to help them reach their fullest potential and develop the whole person. Worldwide, Presentation College is the only college sponsored by a congregation of Presentation Sisters. Since 2012, Sister Marilyn Dunn has inspired Presentation College students, staff, co-workers and other Presentation People with her weekly reflections. Her digital reflections titled, “Lighting the Way,” share the philosophy, mission, values and history of Presentation Sisters and Presentation College.